P The SE_DACL_PROTECTED flag is set. AR The SE_DACL_AUTO_INHERIT_REQ flag is set. AI The SE_DACL_AUTO_INHERITED flag is set. SR The SE_SELF_RELATIVE flag is set (not shown with ntfsacl.exe). The self-relative Format is the compact Version of the SD and contains all information in one block. The canonical order ensures that an explicit access-denied ACE is enforced regardless of any explicit access-allowed ACE. 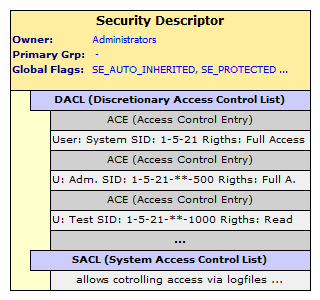 During an access check, the operating system steps through the ACEs in the order in which they appear in the object’s DACL, so that the deny ACE is processed before the allow ACE. Found when evaluating an ACE in a Security Descriptor (SD). e.g. At the root of a disk. Not found in the GUI.